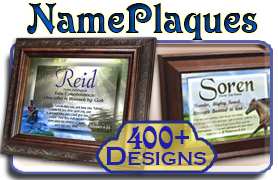 Name Meaning Plaques, framed with your choice of Flower designs, for any name. Not even king Solomon in all his glory was dressed like the flowers of the field. And if God takes such great care in designing and clothing a flower with color, won't He also watch over your life, worth far more? 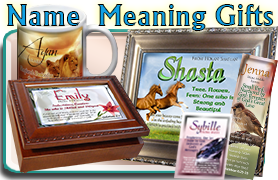 These lovely flower name meaning gifts are framed in your choice of frame, with any name. 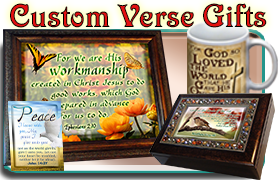 You can include 1, 2 or 3 names with most of these designs, with all name meanings and verses. Take a look at these beautiful floral name meaning prints. 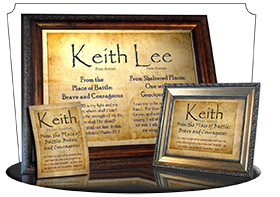 NG-8x10-FL01 8x10 Prints in 10x12 frames for 1, 2 or 3 Names & Meanings! This beautiful and feminine floral name meaning gift captures a delicate gentleness perfectly suited to communicate love and encouragement. White easter flowers grace the background, with a vibrant fiery lily in the lower right corner. 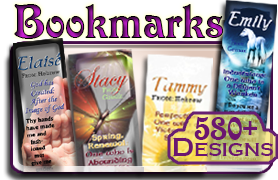 The name meaning bookmark and greeting card feature a similar flower, less pink and more red, with a very elegant typeface for the name and meaning. 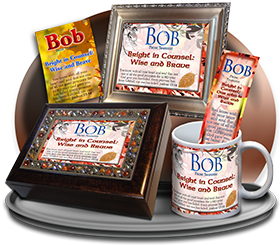 The matching Pocket Card retains all the same name meaning info, perfect for a purse or wallet so they can carry your thoughtful encouragement with them always. 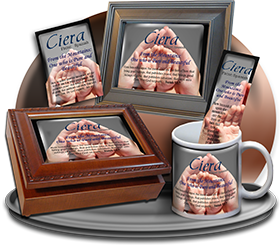 NG-8x10-FL09 8x10 Prints in 10x12 frames for 1, 2 or 3 Names & Meanings! 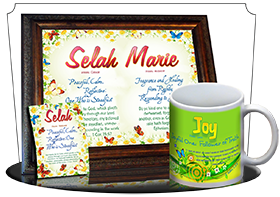 Bright summer colors greet the name bearer of this personalized plaque. The name is in a ribbon pink with the meanings and verses in blue. 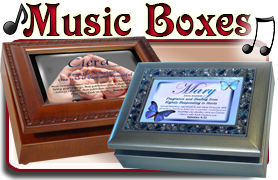 A beautiful assortment of blooming flowers decorates the edges and corners of this framed, custom name meaning art. 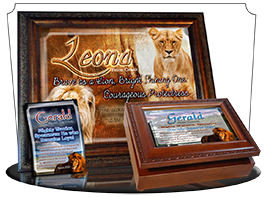 NG-8x10-FL18 8x10 Prints in 10x12 frames for 1, 2 or 3 Names & Meanings! 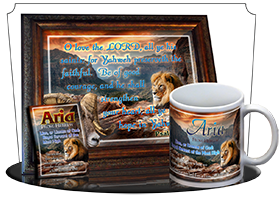 NG-8x10-FL29 8x10 Prints in 10x12 frames for 1, 2 or 3 Names & Meanings! 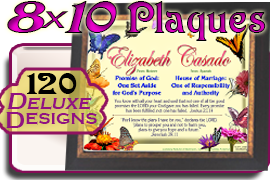 The name on this personalized plaque burns with a red-purple intensity amidst the soft dew-dropped petals of the blue flowers. 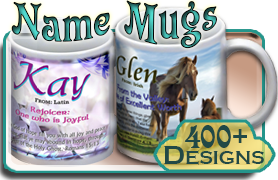 The name meanings are in a curly, friendly font, with the verse in an elegant white. 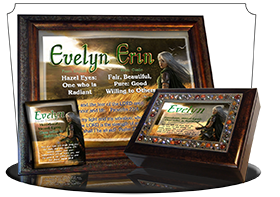 This is a lovely, feminine name meaning gift for 1, 2 or 3 names at once. The meanings and verses will align beneath each name. 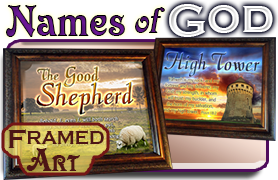 NG-8x10-FL33 8x10 Prints in 10x12 frames for 1, 2 or 3 Names & Meanings! I love the white-to-purple gradient on this pastel name meaning plaque. 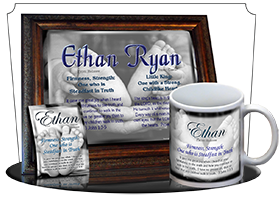 This is a great floral design to personalize with 1, 2 or 3 names. 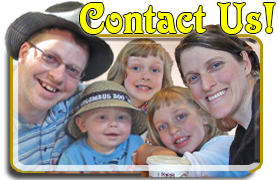 Depending on the length of names and verses, we may use only one or two verses. NG-8x10-FL12 8x10 Prints in 10x12 frames for 1, 2 or 3 Names & Meanings! 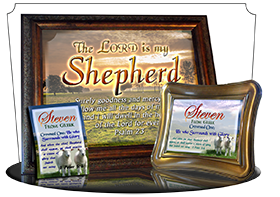 NG-8x10-FL25 8x10 Prints in 10x12 frames for 1, 2 or 3 Names & Meanings!